The small Bimota factory has, for decades, specialized in taking other manufacturer’s engines and building exotic, heart-pounding motorcycles around them. In my opinion, the lat 1990’s were a heyday for them. This has to do with the fact that they chose some really good engines. Many of their bikes use the 2-valve, air-cooled Ducati engine. A nice mill, but at less than 100hp it really seemed ill-matched for a bike dripping with carbon fiber. The YB-11 was one of several exceptions. Dubbed the Superlegerra, about 650 of these machines were produced in total, all using the Yamaha YZF-1000R powerplant. Although Yamaha’s “Thunderace” is overshadowed by its successor, the YZF-R1, the engine in the ‘Ace pushed out a massive 123hp at the rear wheel; only 4hp shy of the first R1. Where the ‘Ace lost out to the R1 was (among other things) weight. At 512lbs wet there is little doubt where the “thunder” came from. The YB11 knocked the wet weight down to 474lbs, which is still very high by today’s standards, but high speed handling actually benefits from the heft and longish wheelbase. 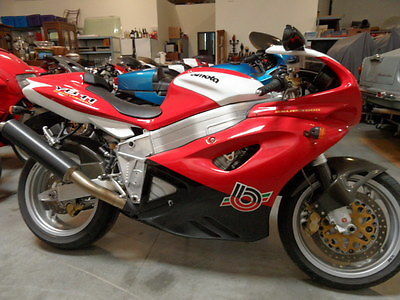 This example on ebay is pristine and low mileage, as are most Bimota’s. Still, with a rock solid engine, there is nothing stopping you from spooling up the odometer on this exotic. In the end it has more to do with how comfortable you are riding a carbon fiber-clad bit of Italian craftsmanship down the road. Personally, when focused on style and feel, the YB11 can give you equal doses exotic, performance, and old-school… and all while being for more rare than a Panigale.